This piece is a companion to the Dean-O-Files podcast #42, published 6/24. It can be found on Alternative Internet Radio. In the past few weeks, I’ve seen quite a bit of activity related to political quizzes stacking up in my social media feeds. Some people hate them, some people love them, and some people have no idea what to do with the information they gained from them, if any. After seeing all this activity, I got curious. As a political outsider, how well represented would I be in the world of political quizzes? Which quizzes best represented where I personally consider myself to be? Which systems of graphical representation were the most accurate? All of these questions and more will be addressed as I compare my results from seven of the more popular quizzes I was able to dig up online. A few notes about neutrality: Not all quizzes allow a person to choose a neutral response, but on those that do, I try to keep the ratio at around 5:1. Meaning that, for every five substantive answers, I will allow myself one neutral answer. I find that this can tighten up results on these quizzes quite a bit. This quiz seems to be the new hotness. 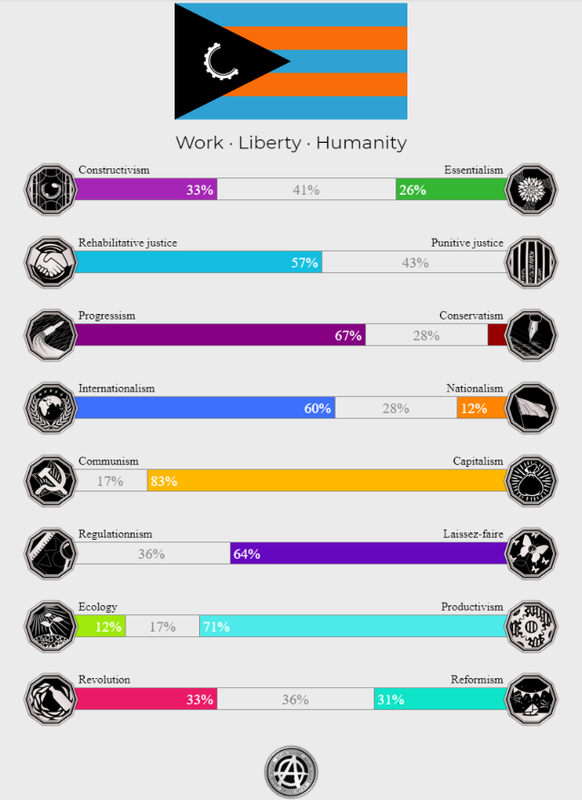 People are posting their PolitiScales results all over the place. 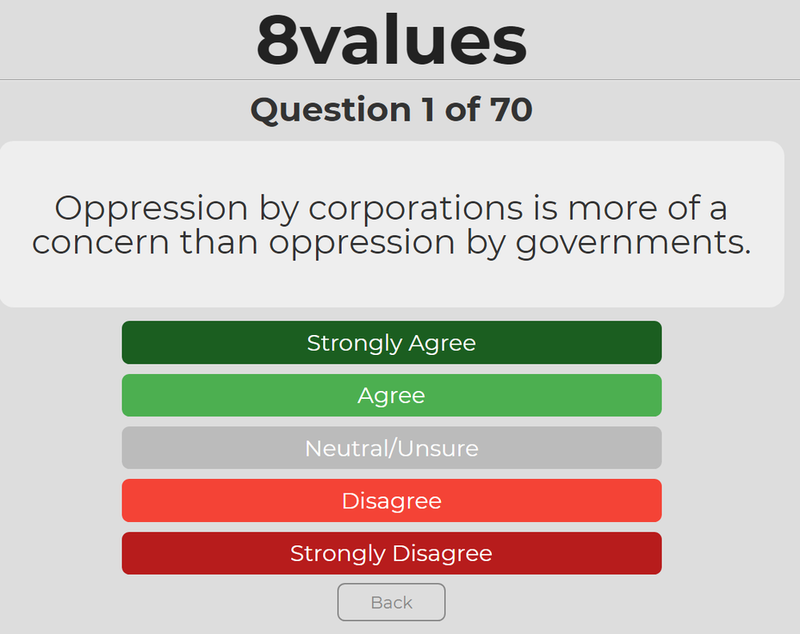 Based on the “8 Values” system, this 117 question quiz features the classic Strongly Agree-Agree-Neutral-Disagree-Strongly Disagree format we will become intimately familiar with over the course of this exercise. The PolitiScales quiz breaks out various aspects of socio-political thought into eight axes, with opposing views on either side. What’s different is that PolitiScales factors in neutrality, and actively shows it to you. Look closely at the Economic axis. That isn’t a 17% support of Communism, that is the approximation of my neutrality. I found this aspect of the quiz to be interesting, as it can also illuminate which aspects of political thought you are less interested in (as in my Justice axis). 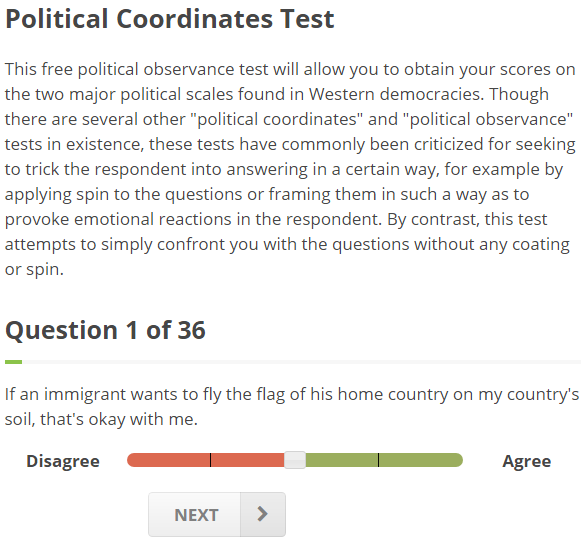 However, like many other quizzes, PolitiScales suffers from a lack of nuance and context. Questions that do not apply to someone like me (a Market Anarchist) abound in this quiz. There are several questions about the Justice System, for example, which mean nothing to me, because my preferred system of social order does not utilize a state prison system. This is par for the course, however. Especially for those of us with more “extreme” political opinions. This is the system that inspired PolitiScales. This system, though, does not display neutrality. Consisting of 70 questions in the same format that PolitiScales uses, this quiz results in a graphic of the breakdown along four axes that place pairs of the eight values in opposition to one another. Comparing the two quizzes we’ve seen so far is interesting, as PolitiScales breaks things down more than 8 Values, but I found both of them to be inaccurate in different ways. For example, PolitiScales shows a heavy bent toward internationalism. 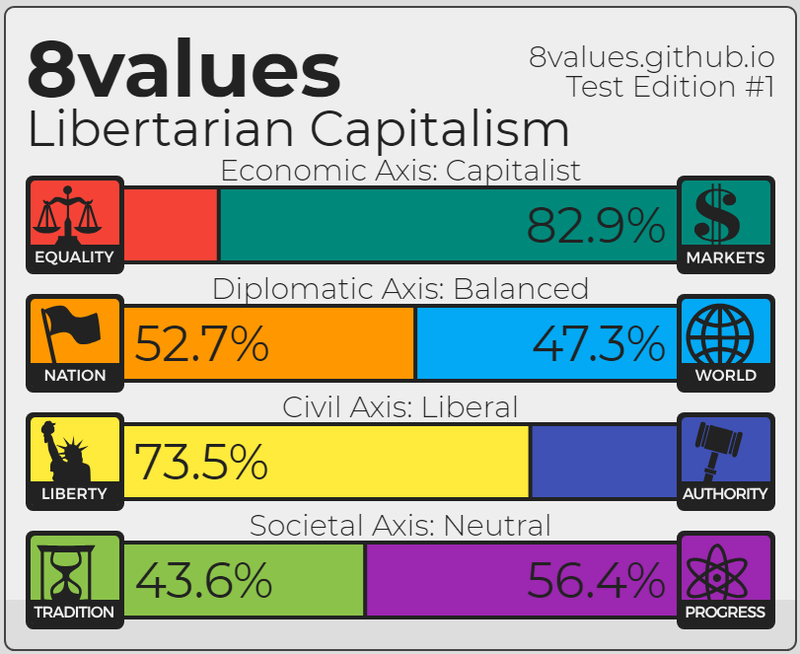 While this may be a logical result of my own political philosophy with regard to trade, I don’t see myself as a person who particularly concerns himself with the “international community.” 8 Values looked about right to me, but it is also incredibly vague. Overall, I’m not impressed with either. This incredibly short quiz from the “Advocates for Self Government” seems to be a little biased. The format consists of a simple Agree-Maybe-Disagree response to questions that almost look designed to funnel people into the Libertarian section of the resulting Nolan-Style plot graph. While it's nice to see the Nolan graph represented (it’s my favorite plot-style graph), the bias I read into this quiz made me dislike it quite a bit. Pew Research Political Typology Quiz. This thing was... dumb... Weird and dumb. 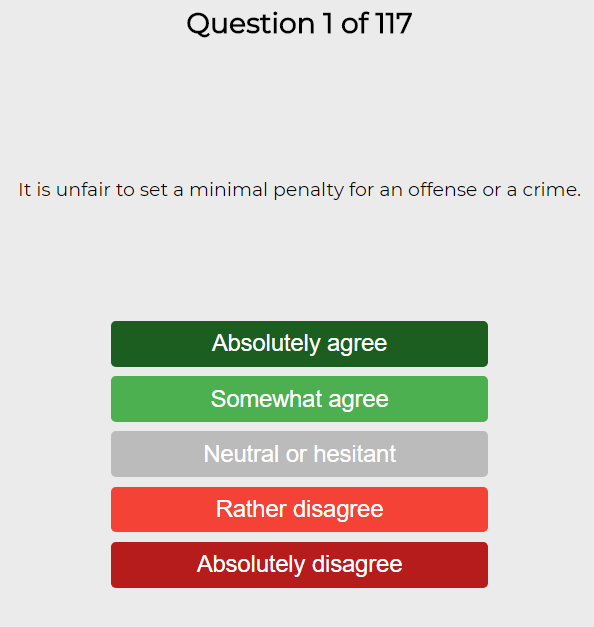 There is no neutral option in this 17-or-so question quiz, which isn’t necessarily bad. What is bad is that the quiz is biased toward the classic two-party outlook. By the end, you are either some type of liberal or some type of conservative. Because of the bias here, being an outsider results in the assignment of some sort of off-the-wall pseudo-ideology no one has ever heard of. At least, it did for me. If you were a relatively party-line believer, you may find use here. For a socio-political rogue? I doubt it. This is a quiz that seems to be modeled after the classic Political Compass. Individual Differences Research offers a 36 question quiz which follows the expected format. The classic. The OG. 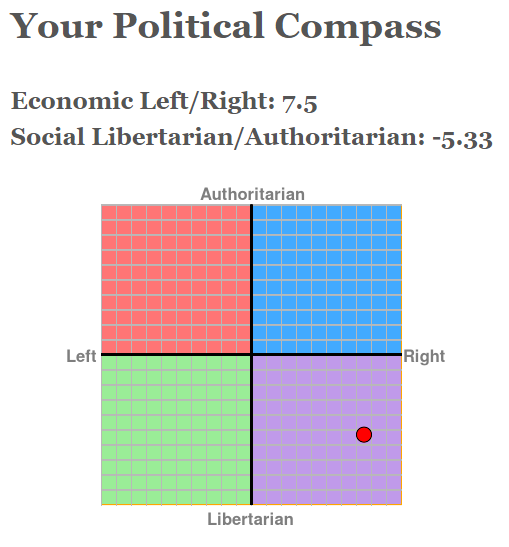 The Political Compass consists of six pages, approximately 60 questions, no neutral option, and very similar questions to 8 Values (in fact, I think 8 Values may have taken no small amount of inspiration from The Political Compass). This looks like the exact same graph I remember receiving from this quiz years ago, despite the fact that I have found my way to the very bottom right corner since those days. Like most of these quizzes, being too far outside the mainstream results in being pulled closer to the center of the graph, because a great many of the questions will simply not apply. The Political Compass is the a’ight-est of political quizzes. Not the greatest, but a good starting point. This roughly 40 question test does a few things very differently from most others. First, and most importantly, clear pros and cons contextualize each individual question. There is little room for misunderstanding or error here as, if you are far outside the mainstream, your position may be acknowledged in either the pro or con section. The next thing this quiz does differently is it does not simply result in a colorful graphic. It results in ideas and, unlike the Pew quiz, the ideas you can find here include those far outside the mainstream. 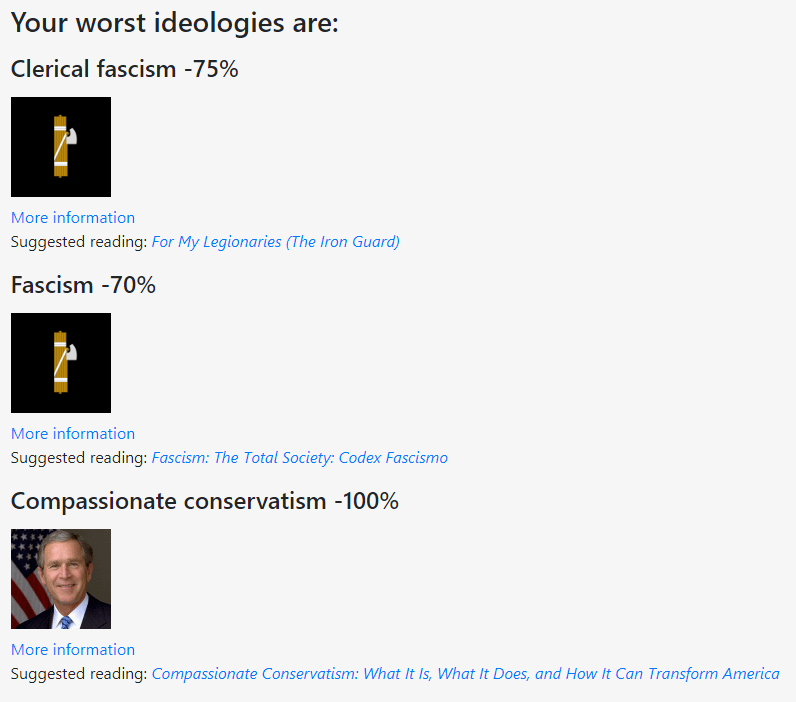 As you can see, the quiz results in the three closest and three farthest ideologies from where you stand, and recommends reading material for each. While this kind of result isn’t particularly pretty, I find it to be infinitely more valuable than a simple and unexplained bar graph. I hope you enjoyed this little departure. I thought this would be a fun exercise, and maybe inspire some people to go take some quizzes! If you do, go ahead and send screenshots of your results to @DeanOFiles on Twitter, I’d be fascinated to see where you land and whether you think the results are accurate! Remember: you needn't provide a real email address to comment.